Save $300.00 When You Buy a Hon Boda Office Chair From Hallmark! Hallmark Office Furniture is pleased to offer a special price on Hon Boda office chairs. Instead of paying the full list price of $599.00, you can purchase this superb chair for just $299.00! Supreme comfort doesn’t have to cost a lot. Boda boasts a breathable mesh fabric that looks cool, keeps you cool, and carries a price that will have you saying “cool.” Available in two styles—one with a mesh back and seat; the other with a mesh back and mesh-covered cushioned seat. Both feature a sleek, integrated design, height-adjustable arms, and synchro-tilt so you can recline with ergonomic ease. Provides an open, comfortable recline that allows you to keep your feet on the floor. Raises and lowers chair to achieve best relationship to work surface. Proper seat height reduces pressure on legs and improves circulation. Swivels over the base, allowing user to remain seated while retrieving items from the active work zone. Adjusts seat and back to a reclined position for all-day comfort. Pivot point located above center of chair base. 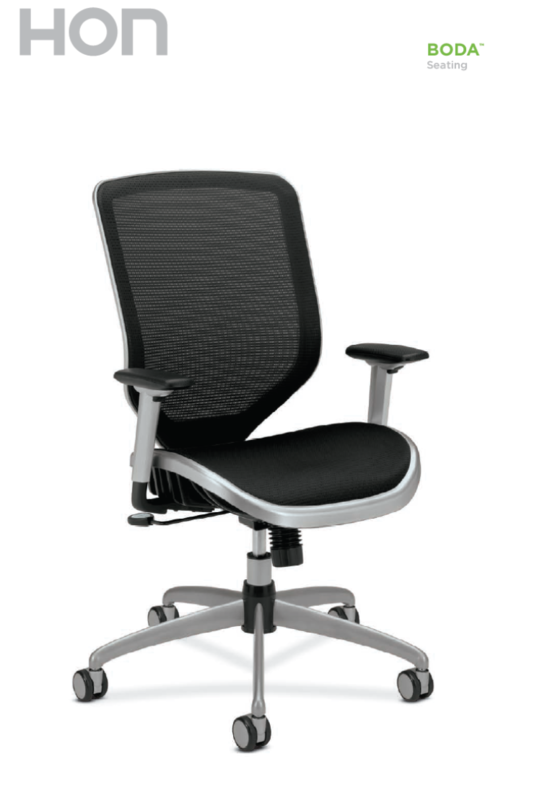 Adjusts the amount of resistance when reclining to accommodate individual weight and work styles. Locks the chair in an upright position for constant back support when not reclining. Contact Dan Stephens today to place your order! This article was posted on Tuesday, August 9th, 2011 at 2:02 pm	and is filed under Specials.